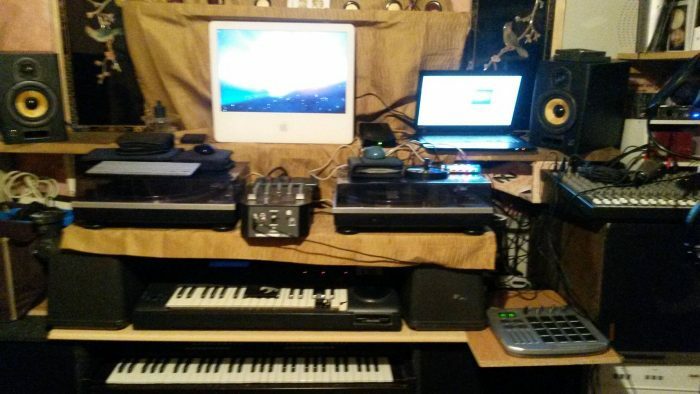 Your Studio, Your way! – ACC Interactive Media Arts Student Blog! When it comes to building your own studio, several people have many different ideas about what is the best path to take, as well as the best equipment to use. In my opinion… it typically depends on what your artistic interests are, what tools you prefer to use , and what you have available to you. So usually you use what you got! I personally am very interested in audio/video production, photography, and animation as well, so my studio is composed of several different components dealing with both audio and visual, in order for me to record my audio, take pictures, and capture my video assets in order for me to create my artistic works. Both Mac and PC computers, in order to speed up the process while working on projects, Yorkville near field studio monitors and Behringer PA monitors with Supersport mixer on board, for when I am mixing and mastering Scores, Yamaha mg16 /6FX mixing console, where all my instruments can be plugged in, a Yamaha VMX 200 USB DJ mixer with some Stanton turntables. If you do have that much room for equipment you can have an M-Audio fast track audio interface, which allows you to plug it into your computer VIA USB and then plug a condenser microphone an acoustic guitar, electric guitar, bass guitar or any 1/4 inch auxiliary cord into in and start recording into your favorite multi-tracking program. If you love to play the keys like I do, than I would suggest a USB keyboard control surface that is compatible with one of the programs that you use, it will allow you to use a wide arrangement of instruments that you will be able to explore and experiment with From banjos to saxophones. If you like to draw and do photography you simply need to download the proper programs and acquire a Wacom drawing tablet, A few backdrops, some lighting, a few video cameras (Nikon D3100 and some GoPros). This entry was posted in General and tagged adobe, Animation, audio industry, Brandon, design, film, Graphic Design, home studio, illustrator, IMA, inspiration, interactive media arts, interactive technology, media, movies, Music, podcasting, technology.